Things are pretty tough right now in Spain. Twenty-five percent unemployment. “Indignados” pitching tents in public parks like the “Occupy” movement did in the US a year ago, and recent massive public demonstrations in Madrid, Barcelona and other large cities. Looming bank bailouts and public sector spending cuts. Happily, things are a whole lot better on the Spanish winemaking front. Spain, in fact, in just the last 20 years or so has really upped its wine game, and if I’m not mistaken—and I don’t think I am—Spain has more land under vine than any other country on the planet. And much of it is at relatively high altitudes, so the cool night air gives the grapes a respite from the brutal Spanish sun and a longer ripening season. Another thing Spain has going for it is a lot of indigenous grape varieties. For example, one of my favorite “French” grapes known there and elsewhere as Grenache, and the basis of one of my favorite wines, Chateauneuf du Pape, is actually an import from Spain, Garnacha. But Spain’s signature red grape is Tempranillo (also called Tinto Fino or Tinto del Pais), the basis of wines from the Rioja, the country’s most high-profile wine region, and Ribera Del Duero, a small but important wine region in the north of Spain where today some of the country’s most prestigious wines are grown and produced. Among whites, three important Spanish grapes are Albarino, Godello and Verdejo, all of which are gaining notice on restaurant wine lists and in retail stores. Anyway, a few weeks ago, I was fortunate enough to have lunch and spend a couple, maybe three hours with one of Spain’s true cultural ambassadors, Carlos Moro Gonzales, who also happens to be the President of its largest (I think) wine-producing enterprise, the Matarromera Group. Carlos is a charming, funny, and totally unassuming guy who does a remarkable amount of travel and outreach on behalf of his seven wineries: Matarromera, Emina, Rento, Valdelosfrailes, Cyan, Emina Rueda, and Emina Oxto. These wineries represent four distinct regions or appellations (Denominación de Origen) in the Duero—Ribera del Duero, Cigales, Toro and Rueda. There’s also a distillery, an olive oil production facility with 150 hectares of olive groves, and a slew of other products including a low-alcohol wine, Eminasin, and a no-alcohol “wine beverage,” Eminazero. They’ve even got a line of cosmetic creams and gels called Esdor, made with extracts of grape polyphenols. 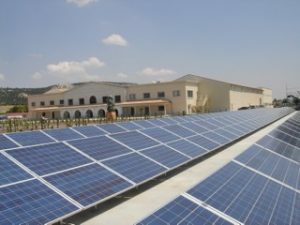 And the company prides itself on its sustainability and use of renewables including solar thermal, biomass and photovoltaic energy. I was a little afraid we’d get caught up in all that, but we were at the Breslin in New York City’s Ace Hotel to taste and talk about the Group’s wines and thankfully, we did. Being the modest guy he is, Carlos didn’t want to go into his personal history or talk about himself at all, other than to say that his family’s association with wine in Spain went back a couple hundred years. Yet the modern Matarromera operation dates only to 1988, with the first vintage produced in 1994. He did go a bit into the company’s expansion to places as far afield as the Philippines, where I’ve lived and never even remotely thought of as a wine market, and of course China, which Matarromera views like any smart winemaker as a place to plant the flag and grow in a big way, and evidently it is. 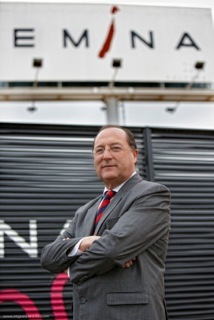 In the US, you can buy his wines in 24 states, including of course New York, and he works with a number of top importers. Hosted by Monika Elling of NYC’s Foundations Marketing Group, the event paired lunch with some of Matarromera’s top wines, but curiously I found the moderate-priced ones the most to my liking. And the real standout among them was a white wine of great character and tremendous value. Emina Verdejo Prestigio 2011: This is a fabulous, tremendous white wine. A very intense aroma, crisp, bracing acidity, and juicy grapefruit taste with a medium to long finish. At $17 retail this is one of the best values I’ve ever seen, tasted or even heard of. VAL Rose 2011: 80% Tempranillo and 20% Verdejo, this wine had a restrained aroma but nice, fresh fruit taste of red cherries and raspberries and was great on the mid-palate. $10 retail. Matarromera Melior 2009: 100% Tempranillo, this is a fresh, easy-drinking red wine served at New York’s Spotted Pig restaurant. It’s a nice introduction to this grape, but nothing special. It gets 6 months in barrel and 6 months in bottle before release. $15 retail. Matarromera Crianza 2008: This is just an outstanding Tempranillo wine at about $28 retail. Aromas of coffee and leather; delicious blackfruit, nice, integrated tannin with a great mouthfeel. Loved it. 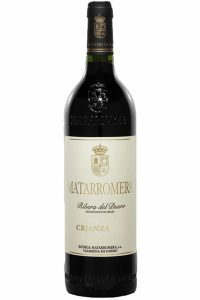 Matarromera Reserva 2006: This rich and concentrated wine, costing about $48 retail, really ups the winery’s game. Dense blackfruit, a little smoke and leather and nice if noticeable tannins. Rento 2005: This single vineyard wine, 100% Tempranillo, was very nicely balanced, powerful and a little spicy, dominated by blackberry flavors. This is also a select vintage wine, as none was produced in 2006, 2007, 2008, or 2009. $50. Cyan la Calera 2004: This wine has a lovely aroma of Violets, noticeably acidic and slightly grainy tannins, probably from the oak. From 80 year old vines. $28. Matarromera Pago de las Solanas 2001: Only 600 bottles produced, and if I heard correctly this retails for $300 a bottle if you can find it. Very jammy and intense, slightly sweet with a long finish. Skip it for a six-pack of Matarromera Crianza 2008. CRIANZA: Wines aged for 2 years with a minimum of 12 months in oak and 12 months in the bottle before being sold. RESERVA: Wines aged for 3 years with a minimum of 12 months in oak and 24 months in the bottle. next post: Great Wine Books for Summer Reading! !